Initial reports said some books were literally burned which the Department of Fisheries and Oceans has subsequently denied. Photo via. 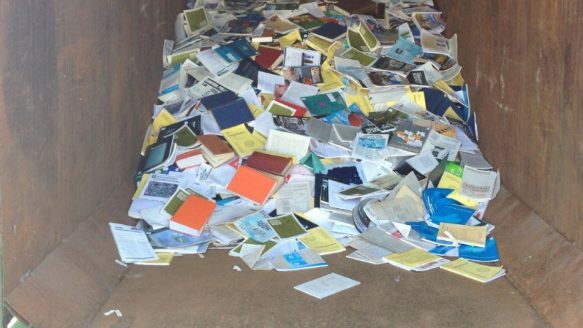 Soon after, a widely disseminated photograph emerged displaying a dumpster at the Maurice Lamontage Institute in Mont-Joli Quebec, stuffed with hundreds of carelessly discarded historic books and documents. In Winnipeg, Gaile Whelan-Enns, an environmental researcher with the Manitoba Wildlands told CBC News that he saved hundreds of documents that he found abandoned in an empty library. "It was really hard to figure out where to start because there was so many documents that you just went 'Oh my God,'" he said, disbelief palpable in his voice. "They just left this lying here?" The incautious nature of the consolidation effort adds another alarming chapter to a Harper government that appears deadset on directing how scientific research is conducted in Canada. Last Sunday, CBC's the Fifth Estate aired an investigation on how the Harper government has dealt with scientists over the past seven years. The doc illustrated a battle between an ideology driven administration and mostly apolitical scientists simply pursuing the facts gleaned from their research, and how it led many to be silenced and defunded. Scientists discussed being hamstrung and dissuaded from pursuing politically inconvenient facts, instances of research that didn't fit policy directives being curtailed or shut down completely; world-renowned researchers who were summarily dismissed and barred from accessing their work; and programs monitoring food inspection, water quality and climate change being reduced. The federal government has dismissed over 2,000 scientists since 2008. The government denies political objectives have anything to do with the decision to close the DFO libraries, citing $473,000 in savings and a lack of public interest as motivation for the decision. Still, regardless of the incentives behind the recent cuts, it's easy to see why on-lookers are viewing this politically suspicious decision with skepticism. Since taking office in 2006, the Harper government has governed with an iron-fist, establishing unprecedented barriers to information on the road to becoming the most secretive administration in Canadian history. This type of fanatical secrecy comes with a host of problems for the public. "Harper's government is different from previous administrations in the disdain it's had for the media, and the obsession this government has with controlling the message," said Dr. Jonathan Rose, an associate professor of Political Science at Queen's University. "Ensuring that citizens have access to the right kind of information to make the proper decisions is integral, and if government is misleading in its communications, then the citizens are unable to do their democratic duty. It's a problem because it inhibits the public's decision-making process." As a whole, the Harper government has proven itself to be no friends of science. An editorial in the New York Times earlier this year excoriated Harper for a prolonged campaign in muzzling scientists. "The government of Canada—led by Stephen Harper—has made it harder and harder for publicly financed scientists to communicate with the public and with other scientists," wrote Verlyn Klinkenborg. "Now the government is doing all it can to monitor and restrict the flow of scientific information, especially concerning research into climate change, fisheries and anything to do with the Alberta tar sands—source of the diluted bitumen that would flow through the controversial Keystone XL pipeline." The cuts mean fewer scientists will be able to research the waters of the Canadian Basin. Photo via. Much of this obfuscation is happening with little outrage from the general public, allowing the Harper government's shadowy bureaucracy to become the new normal. And it's not because Canadians are unaware of Harper's cloak and dagger governing. In a poll conducted by Ipsos Reid for Postmedia and Global News earlier this year, two-thirds of Canadians stated they believed that "the Harper Conservatives are too secretive and have not kept their promise to govern according to high ethical standards." While the Department of Fisheries and Oceans currently contains over 600,000 pieces of material, only 30,000 have been digitized. According to the Department of Fisheries website, they will be discarding duplicates and adding the rest online by request. They failed to mention anything about the books that will not be digitized due to copyright laws. Keeping the public and press in the dark about what's happening at the DFO is not without dangerous historical precedent, says Kelly Toughill, a journalism professor at King's University in Halifax. "About 18 years ago the federal government ignored, then muzzled DFO scientists who were warning that cod was being over-fished in Newfoundland," she wrote to me over email. "The result was the complete collapse of the cod fishery and the complete collapse of the economy of what was then Canada's poorest province." In a 1995 piece that garnered him a National Newspaper Award, Canadian Press reporter Steve Thorne wrote of scientists at the DFO whose research was suppressed and neutered by the government in an eerily similar fashion to what many Canadian scientists are saying today. "Federal fisheries officials routinely destroy memos, minutes and other records to hide politically unpalatable science and thwart access-to-information requests," he wrote. "[...] Officials at the Department of Fisheries and Oceans have even tried to discredit scientists whose findings don't jibe with political agendas." Whether the recent cuts to the DFO were simply capitulations to budget concerns, driven by ideological objectives, or something in between is up for debate. What isn't up for debate is how the Harper government has made the muddling and obsessive guarding of information an administrative mandate, leaving Canadians in the dark in a time when international government encroachments on our personal information are at an all-time high. "The next several months will see a battle over people who want greater accountability and transparency and a government who will try to frame the election message as one of fiscal responsibility," said Dr. Rose. "And it's up to the voters to decide which they find most persuasive."